This BACnet OPC Server securely communicates BACnet over Ethernet to all BACnet devices and objects on the building automation networks. Unlike other BACnet to OPC interfaces, this OPC Server can grant and deny access to tags based on user login. The BACnet OPC Server is a powerful tool that enables a secure access to your building automation systems and opens new connectivity horizons to other parties. Enables users to perform large scale centralized building control and monitoring from a “single seat” workstation. Ability to recognize all BACNet Objects when the JCI controller is enabled as a BACNet device. 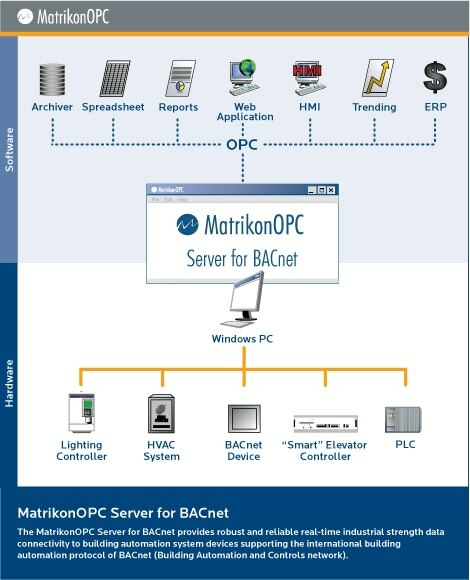 If security and reliability are important for your Building Automation System, then the BACnet OPC Server from MatrikonOPC is what you need. Take action now! The BACnet OPC Server for BACnet Devices is OPC Certified! To support BACnet MS/TP, a gateway device will be required.